I don’t know what the weather is like in your part of the world but here it is the Winter-That-Never-Ends or the Spring-That-Never-Comes (there are still 3 feet of snow where my poor mom lives in the Upper Peninsula so I’ll hush now). Today was dark and rainy, so dark that I had to turn on the lights in my house as though it was nighttime. I needed a pick-me-up. Pronto. So I made this lively and lovely fajita recipe, courtesy of Mark Bittman. Thanks to the darling Margarita at Let’s Cook and Be Friends for choosing this recipe as the Food Matters Project recipe of the week. The original recipe is called “Not Your Usual Steak Fajitas” and can be found on Margarita’s blog by clicking here. 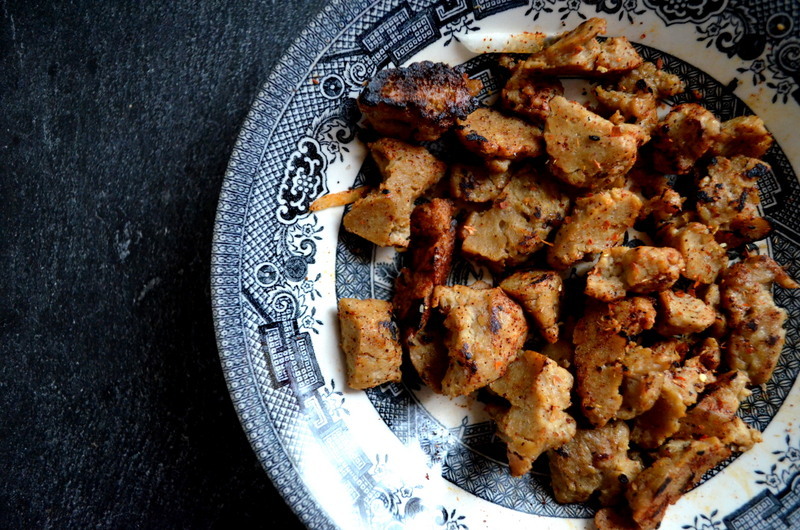 This being a vegetarian blog, I ended up making mine with seitan (seasoned wheat gluten) instead of steak. But if you prefer, you can substitute meat or any meat substitute in this recipe and it will still be delicious. If you want to check out what the other FMP bloggers came up with, head to the Food Matters Project website for more. This recipe uses jicama, an often forgotten vegetable in my cooking repertoire. Jicama tastes a little bit like a green apple when it is uncooked. Cooked, it retains a pleasant crunch and light sweetness. 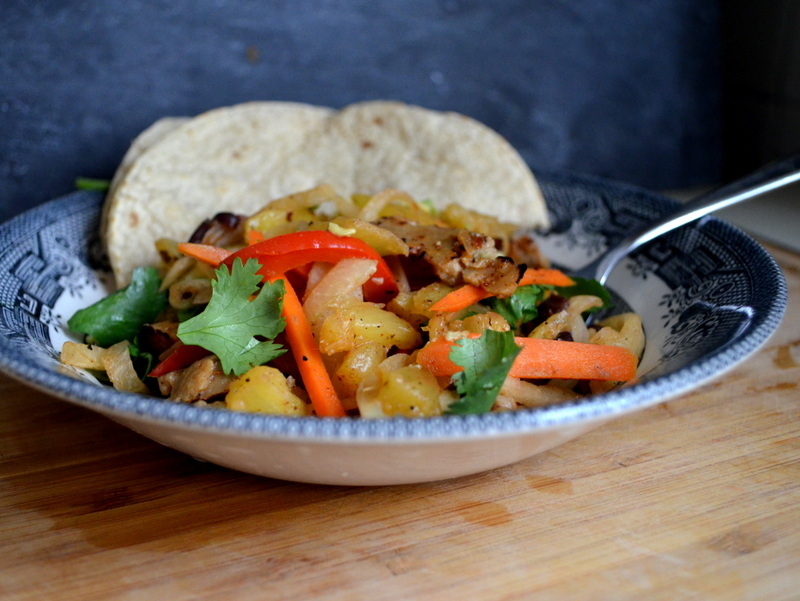 The pineapple and limes in this recipe really bring out the tropical flavors of this dish. 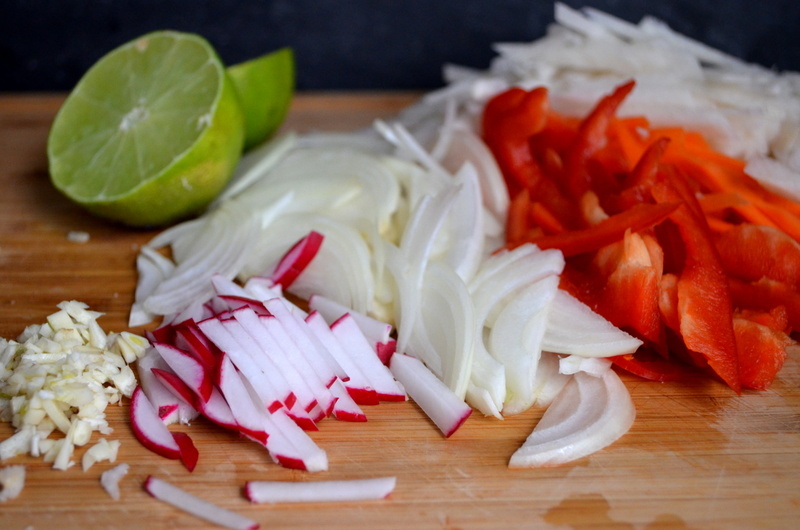 Radishes, Jicama, Onions, Bell Peppers, and Limes ready to go in the skillet. I tried these in taco-form initially but really ended up coming to the conclusion that this is just as good as a stand-alone or served over a bed of rice. Each bite is a reminder of the summer that I know will eventually come. It was a great pick-me-up today and along with my chaser of hot yoga, by the end of the day I was sitting pretty. I hope you enjoy this as much as I did! Put a large skillet over high heat until it smokes, 3 to 4 minutes. Add 1 tablespoon of the oil and, a few seconds later, the seitan/protein. Sprinkle with salt and pepper and stir immediately. Cook, stirring every 20 seconds or so for just a minute or 2 until it has some nice charring on it. Transfer to a plate. Add 1 tablespoon of the remaining oil to the skillet and reduce the heat to medium-high. Add the onion, bell peppers, chile, and garlic and cook, stirring, until soft and golden brown, about 5 minutes. Transfer to the plate with the seitan/protein. Raise the heat to high again and add the jicama, radishes, and carrots. Stir immediately, then cook, stirring every 30 seconds or so, until the vegetables soften and begin to char slightly, 3-5 minutes. Transfer everything to the plate with the seitan/protein. Add the pineapple, lime juice, and water to the skillet. Bring to a boil and cook, stirring to scrape any brown bits stuck to the bottom of the pan, until the glaze thickens a little. Return all the vegetables and seitan/protein to the pan and toss to coat with the lime and pineapple mixture. Garnish with cilantro and serve with warm tortillas. Aura, thanks for letting me know about the comment box in my blog. Your fajitas look delish! I’ve never heard of seitan before and am curious to try it. Also, great description of the jicama. I cooked the leftover jicama in another dish and one of my friends wanted to know what it was! I couldn’t explain and we both didn’t have the words to describe what it tasted like, but you are spot on, it is totally like a green apple! Maybe a cross between a green apple and an Asian pear? So good, right? 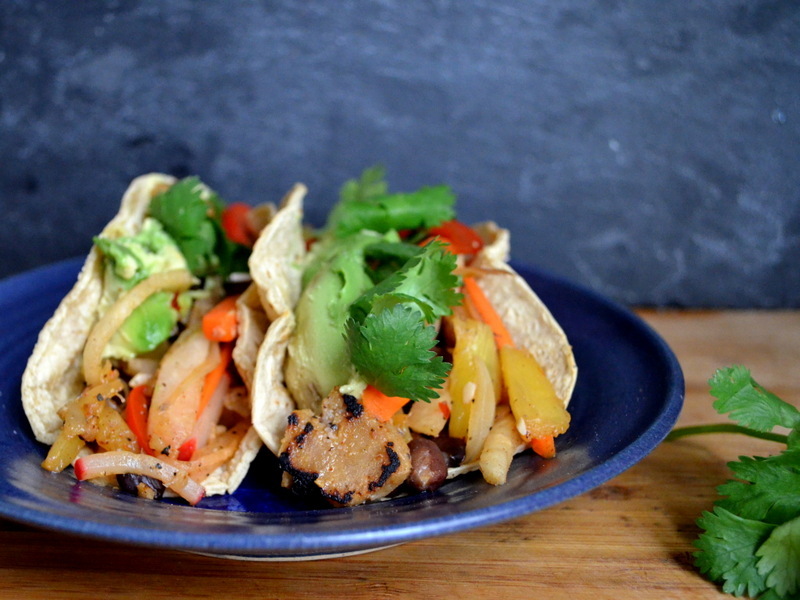 These look great, and veggies in tacos are the best. I didn’t have time to make the recipe, and I’m a little bummed. DC has gotten the perfect weather for grilling (yesterday was a high of 79, hope it stays this way!). Anyway, I hope the spring will make it’s way to MI sooner rather than later so you can enjoy it as well! Thanks, Evi! You should still make the recipe sometime–it’s yummy! I’m jealous of your weather 🙂 Still cold and rainy here. Oh well–April showers bring May flowers! Amazing photos! Hope you warm up soon! Thanks, Lexi! There’s no end in sight 🙂 But last year we had such a warm early spring with a hard frost and lost most of our apples, plums, and cherries so I’ll take this weather over that any day! Beautiful photos. I am always looking for more ways to use jicama! Thanks, Sara! I also love to use jicama in salads in the summer with mango, radishes, avocado, and a lime-based vinaigrette. Mmm!